understanding baha’i symbols and the “greatest name” | doberman pizza. 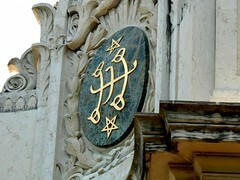 If you know any Baha’is, chances are you’ve seen them using one of three common symbols to indicate their faith. One is the nine-pointed star, which appears in all sorts of places from posters to tombstones. The number nine is significant to Bahá’ís for a few reasons. As the highest single-digit number, it’s seen as a symbol of completeness. It also ties into the ancient art of Arabic numerology, which assigns number values to letters. In this system, the letters of the word Bahá—referring to Bahá’u’lláh, the founder of the Bahá’í Faith—add up to the number nine. Another important symbol is a calligraphic symbol designed by ‘Abdu’l-Bahá, which is based on a stylized representation of the word Bahá. The symbol—dubbed the “ringstone symbol” because of its approved use on rings and other kinds of jewelry—consists of the Arabic letter Ba (?) repeated three times and stacked vertically, with another Ba rotated to form a vertical line connecting three, horizontal lines; the lines at top and bottom sport the letter Há (??) at both ends. 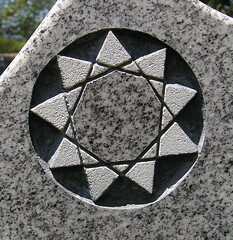 At either side of this symbol are two five-pointed stars. This symbol is also known as the “teaching symbol”, because its layout illustrates one of the most important teachings of the Bahá’í Faith, namely, the relationship of God to humanity. Throughout history, it is said, God has sent His Manifestations—among them Krishna, Buddha, Zoroaster, Moses, Jesus Christ, Muhammad, the Báb, Bahá’u’lláh—to guide humanity and to make His purpose known to us. It is through these Manifestations that human beings have been, and are able to know God; without them, we would not know God, and would not progress, materially or spiritually. Thus, the three horizontal lines in the ringstone symbol represent three “worlds”: the top line, the world of God; the bottom, the world of humanity; and the middle, the world of the Manifestations, which is also rotated ninety degrees to link all three worlds together. Finally, the two five-pointed stars on either side represent the Twin Manifestations of God for this Day, the Báb and Bahá’u’lláh. Finally, there’s the Greatest Name, a calligraphic symbol designed by noted Persian calligrapher Mishkín-Qalam. 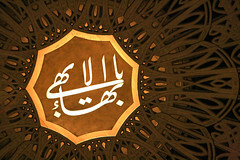 It is a rendering of the phrase Yá Bahá’u’l-Abhá (O Glory of the All-Glorious), an invocation derived from the word Bahá, which is regarded as the “Greatest Name of God” that completes a major tradition of the Qur’an. Its design is meant to resemble a bird. Since it refers more directly to Bahá’u’lláh (the “Glory of God”), it is regarded as a particularly sacred symbol for Bahá’ís, and is generally only displayed in a dignified, respectful and limited manner, for example, being given a place of honour on the wall of a Bahá’í home. This last symbol is a little more complex than the others, and can be a little difficult to explain and understand, unless you happen to read Arabic and understand a little about Arabic calligraphy. Thus, it’s no surprise to find people wondering how they’re actually supposed to read the symbol. Some people may even end up ascribing all sorts of meanings to what seems to them to be an alien-looking image. Many years ago, when I was living in Québec, I put together a diagram analyzing the symbol of the Greatest Name word-for-word, in response to an individual who was struggling to understand it. I lost the original diagram, but I’ve gone ahead and recreated it here below in animated GIF form for your convenience. This entry was posted in baha'i blog by danger. Bookmark the permalink. I wuld like hav the book of Explanation of the Symbol of the Greatest Name.Thank you . Ezat. I deeply appreciate the explanation. My therapist speaks Arabic, and he said it was bahai ee. I am good with that.